Jordie Woods and Andrew Lane met in elementary school, spending their childhood together playing the same sports and living less than a mile away from each other in Radford. On New Year's Eve of Jordie's junior year of high school, Andrew asked her to be his girlfriend. 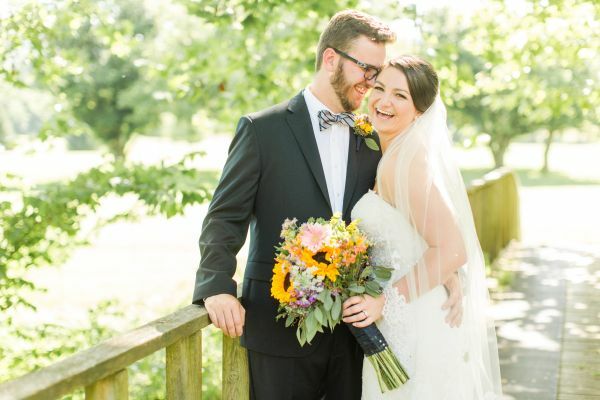 Their romance began, and continued as an unwavering long-distance relationship for five years when Jordie stayed in Blacksburg to attend Virginia Tech while Andrew decided to go to college several hours away. While the couple was on vacation in South Carolina during Jordie's sophomore year at Tech, they had a date night planned: a romantic dinner at a local restaurant followed by a walk on the beach to take pictures with Andrew's new GoPro (an early birthday gift from Jordie). After setting up the GoPro on a time lapse to take photos, Andrew turned to Jordie, and, pulling out a little ring box from his pocket, asked her to be his wife. 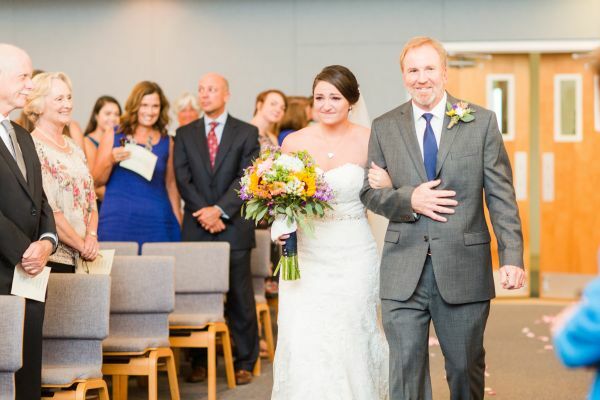 Because family is so important to Jordie and Andrew, they wanted their wedding to reflect their values and traditions, so Andrew's father, a pastor in Radford, officiated the ceremony while Jordie's sister was her maid of honor. 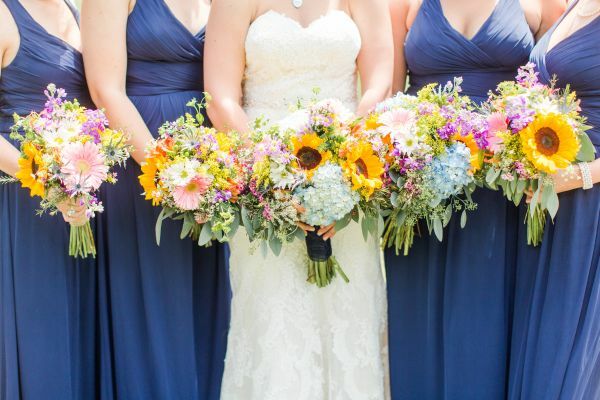 While Jordie feels that "having a traditional wedding makes it hard to be unique," the couple found a big way to make their celebration more special: forgoing the popular "First Look" and instead seeing each other for the first time on their wedding day as Jordie walked down the aisle, carrying her bouquet of bold, multicolored wildflowers. Seeing her future husband at the end of the aisle waiting for her, and knowing that their long wait was over, Jordie says that she was overcome with emotion and "happy-cried the whole way down the aisle." To add another personal element, a dear friend of Jordie played the violin during the couple's traditional and emotional ceremony, a ceremony that the couple's family from all over the United States came to help them celebrate. "It was amazing to be surrounded by family who love us so much," Jordie says. Make sure to see more of the Lane wedding on page 34 of bridebook! Erin Brookshier had no idea that she was on a blind date when a close friend (who would end up being a bridesmaid!) picked her up with a few others for a casual game of recreation league soccer. She hit it off instantly with someone who was already in the car: Rob Edmonds. Their connection was immediate, and he called her the very next day to ask her out on their first official date. One early Saturday morning at 3 a.m., Rob and early-bird Erin (who is often up before dawn, as a morning reporter at WSLS10) hiked together to the Peaks of Otter, a hike that Erin's family had done many times in her childhood. When they reached the top of the trail, Rob proposed to Erin with the sunrise as their only audience. The "excited" future bride and groom then hiked back down to enjoy a huge celebratory breakfast. Erin and Rob celebrated their special day by acknowledging the importance of family. A tree-planting ceremony, where Rob and Erin brought soil from each of their parents' homes, symbolized the two families becoming one. 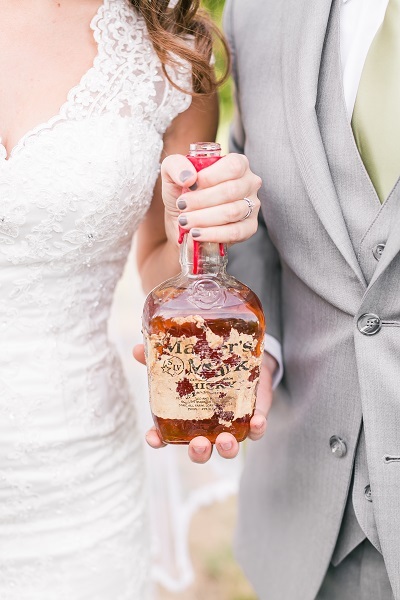 In addition to the tree-planting ceremony, the couple partook in "burying the bourbon," an old southern tradition to ensure good weather on the wedding day. Even though the weather forecast predicted rain for the whole week, the Edmonds wedding took place on a 92-degree Saturday beneath a cloudless sky. The beauty of the wedding ceremony itself was in the details: the couple's "pre-wedding bonding time" where they created their own centerpieces, Erin's veil (it had been her mother's at her wedding in 1984) and Erin's father's cufflinks, which she had given to him as a gift the night before the wedding. These cufflinks, which Erin thought "were very special," read on one side, "I'll always be your little girl." In addition to an enchanting venue and entertainment services, these small details played a integral role in the celebration of two families becoming one. 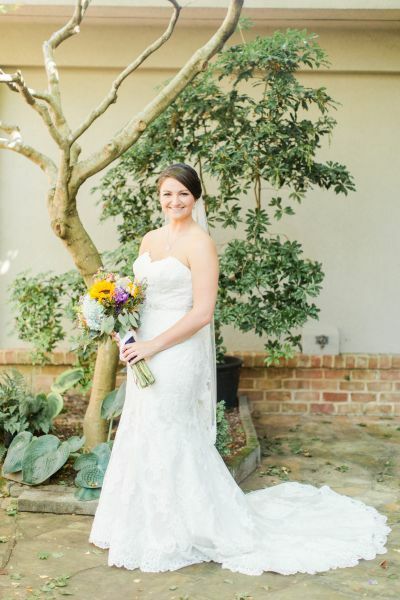 Make sure to see more of the Edmonds wedding on page 30 of bridebook! Justin and Ashley met through mutual friends (who coincidentally were married the weekend after the Winges!). One night when she came home, she found Justin on one knee with "Marry Me" spelled out in rose petals. Ashley says her favorite memory was walking down the aisle. 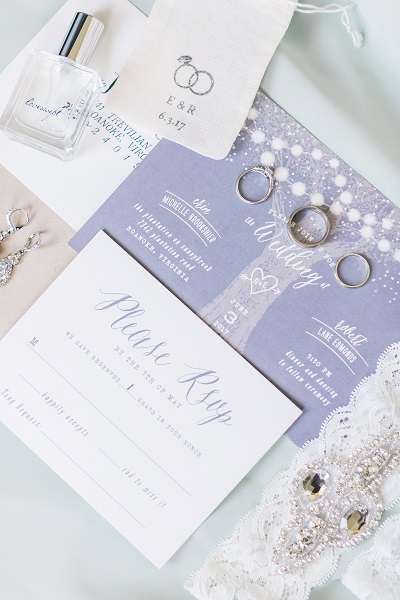 Being surrounded by friends and family and sharing their special day made her emotional. Ashley wanted a vintage elegance theme for her day, with the classic touches such as church ceremony, black tuxedos, and beautiful ball gown. 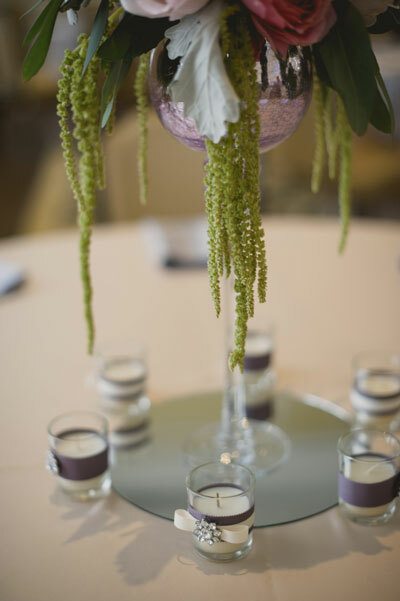 Muted colors of pinks, purple, greens, blues, and yellows complemented their decor, including centerpieces in tall glass goblets on round mirrors. Ribbon and crystal embellished votives lined the mirror, while the flowers included dahlias, hydrangeas, garden roses, anemones, and more. Ashley's champagne organza ball gown had a sweetheart neckline with embroidered lace, with the waistline accented with a Swarovski brooch. She later changed into a short white dress for the reception. Guests chose their favorites pieces from the extensive candy bar and also took home little succulents at their place settings. They also signed a guest tree, rather than book, with a custom oak tree drawing with the couple's name and wedding date; guests could sign a leaf on the tree and it now hangs on display at their home! The couple went to Cancun for their honeymoon, staying in Live Aqua for its spa-like atmosphere where they could relax and enjoy each other's company as man and wife. Be sure to see the Winge wedding on page 92 of the second issue of bridebook, on newsstands now!